The Volgograd Arena in Volgograd which will host the 2018 World Cup Group D fixture between Nigeria and Iceland on June 22 is now ready, according to the website of FSUE Sport-Engineering, which is the developer and designer of the arena, writes Ria Sport. The stadium which was built on site of the demolished Central Stadium, at the foot of the Mamayev Kurgan memorial complex, near the Volga Rivera has a capacity of 45,568 spectators. Before Nigeria's meeting with Iceland at Volgograd Arena, Tunisia will take on England on June 18. The two other matches that will be played at the stadium are : Saudi Arabia vs Egypt (June 25) and Japan vs Poland (June 28). In late February, FIFA boss Gianni Infantino said that Russia is ready for the tournament by 99%, and it remains just the finishing touches. 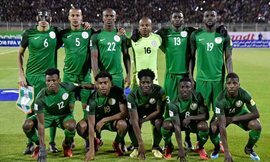 The Super Eagles World Cup opener against Croatia on June 16 will take place at Kaliningrad Stadium, Kaliningrad, while they will wrap up group play against Argentina at Krestovsky Stadium, Saint Petersburg ten days later.